Probably one of the more popular inhabitants of my nano reef – and undoubtably my own personal favorite crustacean – is “Percy” the porcelain or anemone crab. His cool name, looks and peaceful character make him very loveable, but what do we know about the porcelain crab? Let’s take a closer look. With a maximum body width of about 3 cm or 1 inch, it’s a perfect critter to have in your nano reef tank, not only because of their small size, but also because of their very peaceful temperament. Although they look quite threatening with their badass claws, they only use them to fend of intruders. In fact, the “porcelain” in their name stands for the fact that they often shed their limbs when feeling threatened. Some time ago, I noticed Percy was missing his right claw, but after 2 molts (not even a month) he already had his full grown claw back… nature is amazing! They mostly live in pairs and will rarely leave the comfort of their home, which – as its name suggests – is in most cases an anemone. But do not despair, if you’re not a fan of anemones, they are also known to host Hairy Mushrooms (Rhodactis Indosinensis) as mine is doing for over 2 years now. You read that right. Notice I mentioned “crustacean” above and not “crab”. That’s because in theory, the porcelain crab is not a real crab. It resembles a crab, but is much closer related to the squat lobster, so the back part is curled up under its body. 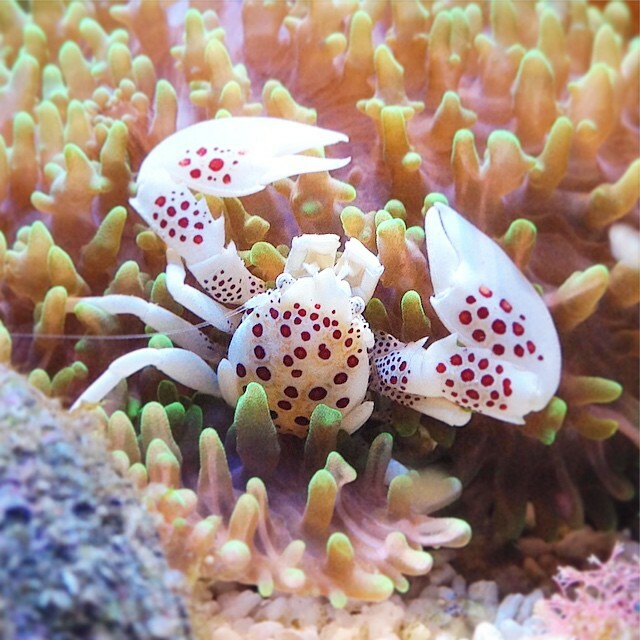 Porcelain crabs are know to be filter feeders, which means they filter food for plankton in a very elegant way. They have an extra pair of fan-shaped arms for this which they constantly hold up against the flow. As our tanks aren’t always the richest source of plankton, you can feed them with for example Reef-Roids but they will also accept larger portions like shrimps or pieces of fish. Something I’ve noticed with Percy but I can’t find any info online about it… It seems the older Percy gets, the more dots appear on his body. I could be wrong about this, so if you know what’s the deal with that or you have some questions, leave some comments below and I’ll get back to you as soon as possible. Hey, great post here and glad I stumbled upon it. My kids have been bugging me to get a snake… a python. They’re 7 and 10, and of course don’t realize what they’re getting into. That doesn’t stop them from bringing it up relentlessly. I will show them your page and see if I can’t turn their interest in this direction. Thanks again. I’m posting a lot more about Percy on my Instagram account so be sure to check it out! Another great and informative article about this extraordinary crustacean. Thanks for clarifying why you didn’t term it a crab. Just because it looks like one, doesn’t mean it is. Thank you, Francis. I try to keep it light but informative. Wow so cool, I had no idea that crabs shed limbs! That’s pretty insane. Thanks for this post, very cool read. Most don’t, but hence the name of the porcelain crab, “breakable” 😉 You’re welcome! Cool post, and very interesting website! This is my first time introduction to the nano reef. What an interesting concept and a great addition to your home. 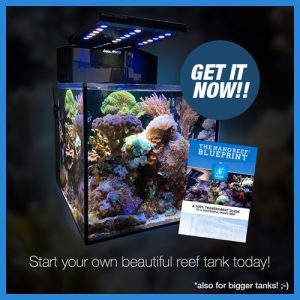 Percy seems like a welcome addition to your reef environment. He does look pretty rugged with those large claws. I can’t believe they can grow back in a month. Crazy! Nice to hear, Jason. I must say it has become the center piece of our home, and I love it more and more each day! Percy certainly is one of my favorite critters as I mentioned before and he’s great for beginning reefers also, so If you would like to give it a try, I would be more then happy to help you out. Hi what a beautiful website, I love these colours and your explanations of these little creatures. Thank you Neil, doing my best here so I’m glad it is appreciated! What a cute looking crab. Are these the ones that hide in shells? Are they hard to look after? Nice website. Thank you for the information and cute crab. It sure is 🙂 The ones you’re referring to are hermit crabs, they actually use shells to protect the vulnerable back part of their body. Will write more about them soon! Both of these species are not really hard to take care of, but they do need the right environment and that is a bit harder to maintain. But I hope my website will guide you in the right direction. Thanks for the nice comments!